Meet Alexandra (Alex), the youngest of four children in the Strzepa family of Shrewsbury, MA. Adopted from Korea as an infant, she initially met all developmental milestones until walking, when her excessive tripping and falling began. The Strzepas took her to Children's Hospital, where they received Alex's cerebral palsy diagnosis. Further genetic testing confirmed hereditary spastic paresis. 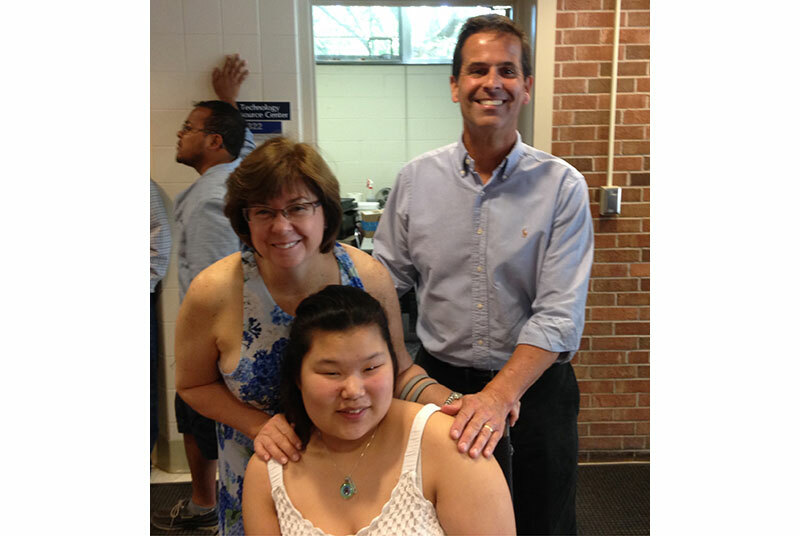 Alex pictured with her parents, Donna and Michael, from Shrewsbury, MA. As a nurse practitioner, Alex's mother, Donna, understood the importance of early intervention along with the ins and outs of healthcare and insurance issues. This is why her daughter's journey towards independence with physical therapy began when she was only one year old. Now age 13, she still gets physical therapy once a week at school, goes to traditional PT locally, does swim therapy along with hippotherapy and travels to Michigan for summer intensive PT at Euro-Peds National Center for Intensive Pediatric PT. This is where Alex recently achieved a new-found level of independence by walking with forearm crutches this summer. Donna explains best how intensive physical therapy works to help children achieve greater mobility and improved functional skills. "Intensive PT differs from traditional PT because you can progress or maximize an individual's potential enormously by working with them for concentrated periods of time. Similar to school, if you were to educate a child for 45 minutes twice per week versus 20 hours per week, the learning differences would be quite visible. It's phenomenal to "jump-start" strength and mobility in children with gross-motor disabilities." "As a nurse, I could efficiently review and understand research articles and literature about the intensive PT model. While I do not work with children, I have taken care of many adults who suffered strokes or spinal cord injury. Rehab is most successful if done in a center specialized to take care of these types of patients, and gains are much more impressive when the therapy is given in an intensive format, multiple hours per day, every day," Donna shared. After meeting Euro-Pēds director at the Boston Abilities Expo, the Strzepa family felt it worthwhile to bring Alex to Michigan for two weeks. "It was definitely the right decision. Her accomplishments over 10 days of treatment are amazing! Alex gained so much strength to improve mobility, and most importantly, she is proud of herself. This confidence will motivate her to continue working hard and improving her strength and walking using forearm crutches." Alex pictured with her therapist Shelley. Alex enjoys swimming, loves riding her horse "Mister," and like many teenage girls, she also likes reading, watching You Tube and shopping. 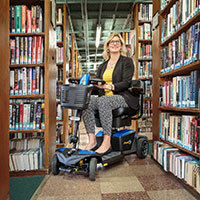 Thanks to Euro-Peds, she now has a much easier time walking in and out of stores. Her crutches provide confidence and give her a new-found level of independence, which is especially important during young adult years. "Alex never would have accomplished this through traditional PT alone. Traditional therapy sessions do not engage individuals in long enough periods of time, but her local PT integrated with other forms of therapy will now help maintain this progress." "With a hotel so close by, it was easy to bring Alex across the street every morning, and great to see how excited she was to be here. She did not perceive intensive PT time as difficult. The therapists made her feel welcome and accepted. We had often wondered and inquired if crutches would be suitable for Alex, and were told she was too weak. Her ability to use them is the most notable aspect of our intensive therapy experience. Donna is incorporating what Alex learned in Michigan this summer in Shrewsbury, starting with sharing her Euro-Pēds' personalized home exercise program video, with all of her at-home PTs. "My only regret is this type of program cannot be afforded to every child with a physical disability. They all deserve no less, and we are grateful Alex was able to participate in Euro-Pēds' program. She will definitely return next year. It is one of the most worthwhile investments we can make towards her future." Euro-Pēds has been part of Abilities Expos throughout the United States for almost 15 years, connecting with thousands of families like the Strzepas. The center opened as North America's first intensive pediatric physical therapy center in 1999 for families throughout the U.S. and beyond seeking a specialized regimen of practice conditions, including use of the Universal Exercise Unit and optional, patented suit therapy to optimize motor training and significantly improve motor skills. "Helping patients from nearly every state, like Alex in Massachusetts, learn new skills, improve mobility, self-esteem and independence is an honor and one of many reasons Euro-Pēds attends the Abilities Expos. Being a part of the event's workshops also allows us to educate caregivers of children and young adults who have cerebral palsy, traumatic brain injury, spina bifida and a variety of other gross motor disorders about the many opportunities that can enrich their lives," said Michelle Haney, PT, MSPT, Director of Euro-Pēds National Center for Intensive Pediatric PT and President and Founder of the Euro-Pēds Foundation. For more information about Euro-Pēds' individualized programs based on intensive therapy techniques originally pioneered in Eastern Europe and blended with best practices developed in the United States, visit www.EuroPeds.org or call (248) 857-6776. For more information about grants that the Euro-Peds Foundation provides, visit www.EuroPedsFoundation.org.